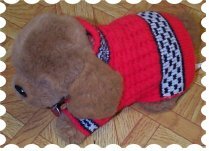 I am going to try and explain how I use the charts to create my knit dog sweater coats pattern. I found this little pet shirt or dog sweater at a thrift store. 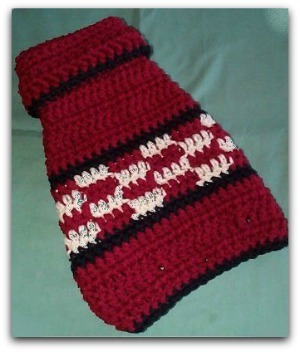 This was perfect for my small breed dog and I wanted to make one like it for each one in crochet and one loom knitted. Graph paper is something I use all the time. It is so easy to figure a pattern using the squares. One square most often equals one stitch, in the designs I make up. This way I can get the over all feel and look of the pattern I am working on. No need to dig through paragraphs of notes with the knitting charts. Just a glance and you know right where you are working. For this pattern I made two charts. One for crocheting and one for loom knitting. You can also use it for hand and machine knitting patterns. I didn’t use any special stitches in either of these patterns. The crocheted sweater I made up using just double crochet and single crochet stitches. 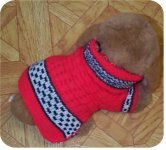 For the loom knit dog sweater, I used just the knit stitch. To make my design in both sweaters, I changed colors as needed to copy the design in the tiny sweater I bought. 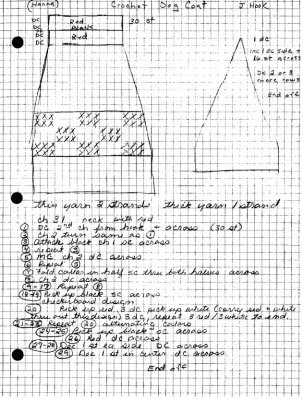 This is the knitting charts for the sweater, very basic but it works, also below is the sweater I completed with this chart. I first draw a graph of my project on the paper. Then I started making Xs in the squares where I wanted my design. These Xs marked all my black stitches, the stitches I wanted white I just left blank. These are very basic knitting charts, but you get the idea. You can find charts very detailed for intricate designs. But here I am just trying to give you an idea of how to use the charts. Okay I have my chart drawn out for a rough idea of my plan. I start at the bottom right corner and knit or crocheted up. Right to left than left to right and so on. My plan often changes before the project is completed. There are always minor things that need to be adjusted or tweaked. 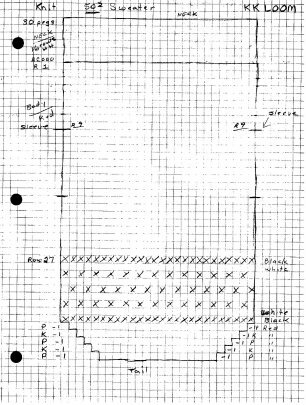 But than that is why I make my knitting charts in pencil. When I have completed my project, I take the chart and redo it with the changes I have made and make up a new one. Here is one of my reluctant models. This is Tiffany in the loom knit sweater.